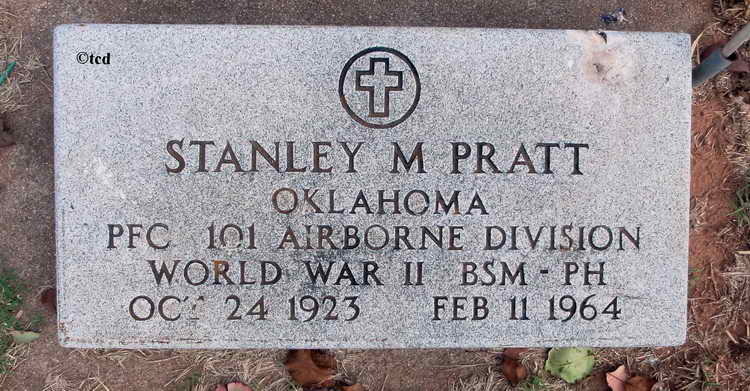 Grave marker for Stanley M. Pratt in Grace Hill Cemetery, Perry (Noble county), Oklahoma. Stanly enlisted in the Army at Oklahoma City, OK on 12 January 1942 and was assigned to Hq/3, 508th PIR. Pvt Pratt was declared a qualified parachutist on 12 March 1943. On 9 August 1943 Pfc Pratt was transferred from Detached Service at SCU 5410 STAR The Citadel, Charleston, SC to AST University NC State, College of A&E Raleigh, NC.. He did not return to the 508th and, based on his grave marker, was later transferred to the 101st Airborne Division.